Who would have ever thought I would get excited about seeing something green on sale in the grocery store? But that’s what happened when I walked by these super thin asparagus spears. How often do I find thin asparagus that doesn’t look half dead and is on sale? Rarely. And I sort of like asparagus. Sort of. And by “sort of,” I mean I can chew a spear or two without wanting to upchuck. The whole upchucking thing usually doesn’t happen until the third of fourth spear. But I figured I could possibly prevent that mess if I coated these in something crispy and cheesy. That combination never fails. These were so incredibly easy to make and tasted delicious – kind of like little asparagus “fries.” I made a big batch yesterday and ate nearly all of them before deciding to let Mr. How Sweet in on the goodness. He tasted one and decided he loved them so much that he would take the remaining ones for lunch today. I’m not quite sure how well they will reheat, but for someone who will eat an eight-day old burger with moldy cheese from the depths of our fridge… I think they will certainly fit the bill. I also think that these will taste even better with thicker asparagus spears. While I love the thin ones (thin = less vegetable chewing), the thick ones will be extra crunchy and get more crispy and cheesy. I’m all for more crisp and cheese. Who isn’t? Preheat oven to 425 degrees. Lay a wire rack on a baking sheet and coat with non-stick spray. Snap off the tough ends of each asparagus spear. On two separate plates, add the eggs whites (lightly beaten) and the panko + flour + cheese. Season the panko mixture with salt and pepper if desires. 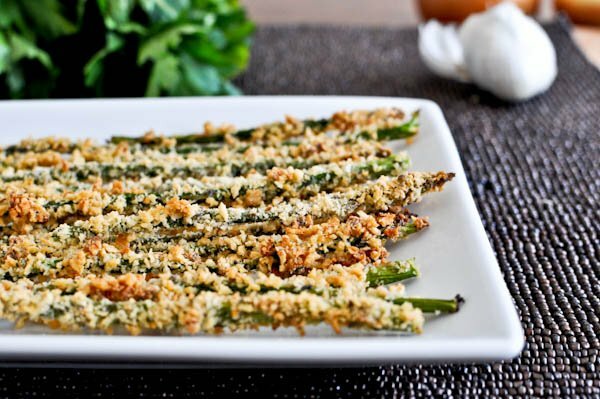 Coat each asparagus spear in egg whites, then lay in the panko mixture and thoroughly cover. If the panko won’t stick, dip back in the egg whites and roll in panko once again. Lay each spear on the wire rack. Bake at 425 for 15 minutes, or until golden brown and crispy. Okay. That’s enough of the green stuff for me. Three Things I Didn’t Cook This Weekend. These sound delicious. I’ve already started thinking of other veggies this would work on. My sweetie was HIGHLY offended when I suggested that he would eat the moldy burger from the depth of the fridge. Isn’t it nice that Pinterest aficionados make you chuckle first thing in the morning. Just made these…. so good! Thanks for the recipe. You might try Panko bread crumbs instead of flour. They will be even crunchier! I will try this with an egg replacer wash and my Vegan “Parmesean” to see how it turns out! I need to know! How about veganaise to make it stick? I would make sure it is a very deep plate. My fiesta plates made a mess. Maybe I will use bread pans next time. I tried these (minus the flour)…they came out great! My six year old even ate them :-) I’m interested to see how they reheat tomorrow night. Thanks for sharing the recipe! I’ll be searching for more recipes on your site…thanks! omg these look so good and easy to make! We usually eat grilled asparagus with a drizzle of olive oil and garlic so I thought why not try this recipe. We all thought there was no taste. They were very crunchy, but I think the flour is what made it tasteless. I know we will stick to our simple yet tasty way! Made these tonight! Even had skinny asparagus lol. Sooo good. Don’t feel like enough of the breading stayed on, will add a touch of olive oil to the egg wash next time and let you know!!! here’s my page, I’ll post your recipe for my fans! Pingback: HooplaHa - Eat Your Veggies Day! 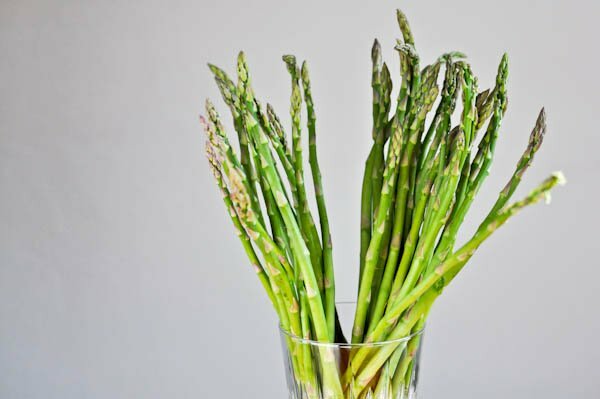 Pingback: Asparagus: How do you eat yours? I found this on Pinterest. I’ve made in a few times and they turn out perfect every single time! I love this recipe and I would say that a wire rack is required to make them perfect! I love asparagus and this recipe looks delicious. it is great for a healthy low calorie diet. I can’t wait to try it. “upchuck, 8 day old, moldy” Chefs, Beware!